The best ham in the world doesn't come easy. To some, Severiano “Seve” Sánchez unquestionably has the greatest job in the world. He has been employed by Cinco Jotas—one of the world’s premium jamón companies based out of Jabugo, Spain—for 25 years, principally as its premier ham carver. In Spain, pork is king, and the cured pork leg the crown jewel. 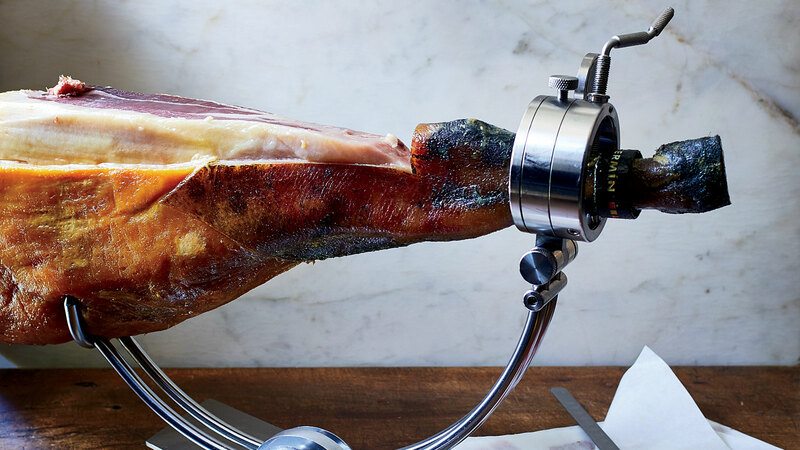 Understanding the correct way to break down and slice a ham leg takes months of training and years to perfect—something Sánchez knows all too well, as he routinely travels around the world to teach people who want to learn the trade. Since Sánchez has never learned how to speak English, he employs translators wherever he goes. Recently, he has been journeying to China, the United Kingdom and the United States multiple times a year. A true local, he was been born in Jabugo but eventually moving to a nearby village, Fuenteheridos, after getting married, per local custom that instructs couples to reside in the bride’s village. His career at Cinco Jotas has taken many turns, from the hospitality department to the warehouse, where he was a manager, to the carving room, where he oversaw quality control. But it’s carving itself—the craft he's developed over the years—that has his heart. In an interview conducted in Spanish, he explains the time commitment required to become a master carver. “Ultimately, the timeframe to become a master carver depends on the skills of each individual person. Cinco Jotas’ initial training course, where all the concepts are taught, lasts 45 days,” he explains. “I can’t get enough jamón and I have three favorites that are available in the US—Cinco Jotas (from $35), Covap (from $25) and Fermín (from $10)—all from southwestern Spain. That region has lots of delicious acorns to fatten up the pigs.” All from latienda.com. “From there, the carver has to practice to develop his skills. This process can last between 6-12 months. Before a year, a carver never gets to be considered a professional in any sense of the word. And an expert? Nobody would call anybody that before he or she had years of experience,” Sánchez says. In general, an apprenticeship, where one is constantly being instructed and overseen, would last between three and five years. Among other things, key points that a new carver would learn include: warming the cellar-cold ham to room temperature before carving; slicing at a specific pace to ensure the fat doesn’t oxidize; how to wield up to six special knives including the long, thin and aptly named jamonero; and how to use each knife on different parts of the leg, ensuring that as little muscle as possible is wasted, but that all cuts are relatively uniform in thickness and size, according to the part of the leg being cut. Applying the right amount of pressure is paramount. You must press in a way that the knife leads and the hand follows, in order to ensure a cut that is paper-thin and follows the grooves of cured muscle, Sánchez explains. This delicate stroke, along with constantly-sharpened knives, ensures that fat is spread properly and generously in a thin sheen across each ham slice. Need more proof beyond these specific skills that Sánchez is the best of the best? “The Spanish Royal Family has a private selection of Cinco Jotas ham that they buy every year from the Jabugo cellars,” director of communications Maria Castro Bermudez tells me. “Sánchez is the master carver that oversees important events at the royal palace, including royal weddings and, most recently, the coronation of Spain’s newest king, Felipe VI.” Sold.